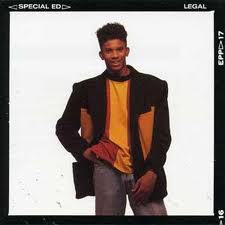 At the tender age of 16 Edward Archer (better known as Special Ed) recorded his debut album Youngest In Charge , which made a ton of noise upon its release in 1989. On the strength of the lead single “Got It Made” and the youngwhipper snapper’s ability to bend and mend words together, Youngest In Charge went on to move more that 500,000 units and in 1998 (when the magazine still had an ounce of credibility left) earned a spot on The Source’s 100 best albums of all time list. In 1990, Edward turned 18, and to celebrate his initiation into manhood (and to validate his eligibility for any interested ladies) aptly titled his sophomore album Legal . Legal would follow the same format as Youngest In Charge , relying on witty lyrics from Edward and production supplied by Howie Tee, but was not as commercially successful as the former. The commercial failure of Legal caused Edward to completely alienate his style and adapted a flow that fell somewhere in between him sounding mentally retarded and constipated on his third release Revelations , before he would forever fade into the black hole that has consumed many a golden era emcee. But I digress. Now let us put our focus back on the competent and regular Edward and Legal . Come On, Let’s Move It – This one opens up with an infectious baseline line and instrumental that Edward meticulously rips to shreds. I couldn’t think of a better way to start the evening. The Mission – One of the best story songs in hip-hop history. I still remember the video for this one (which is easily accessible on the world-wide web). Who’ll ever forget Edward showing Mr. Chin his “Flatbush” style. The James Bond theme music sample during the hook was a nice added touch as well. Ya Not So Hot – Well, things couldn’t stay perfect forever. While Edward technically sounds okay the Howie-Tee track leaves a lot to be desired. I’ve always though Edward was an ill lyricist but he didn’t have the greatest rap voice, which can easily get lost with mediocre production. Thus my argument against “Ya Not So Hot”. I’m The Magnificent (Remix) – The original mix of this song was included on Youngest In Charge . Honestly, only the really keen listener will be able to tell the difference between the original and the remix. Still a good song and a nice addition to Legal. I’m Special Ed – Insert commentary for “Ya Not So Hot” here. Ya Wish Ya Could – Insert commentary for “Ya Not So Hot” here. I will add the beginning of the last verse is hilarious as Edward struggles to say “I’m a professional at this” clearly. Either they missed it in the final edit, were on a tight recording budget, or just didn’t give two shits. Ready 2 Attack – Ah, now that’s more like it. Edward spits razor-sharp rhymes over a dope Howie Tee instrumental. I wonder if his lines were aimed at anyone in particular (On Soul Train? Big gold chains and rings? Maybe, Rakim? EPMD?). My only issue with this one is Edward sounds like he recorded it on a speaker phone. 5 Men And A Mic – I’ve always hated this song. That’s right, not dislike, but I hate this song. Howie’s instrumental is garbage and all the emcees sound stiff, sleepy, and as if they’re reading from a script, with the exception of out host. One of Ed’s guest, Little Shawn (anyone remember “Hickeys On Your Chest”? ), would somehow go on to secure himself a solo deal on a major label (Capitol). A feat I’m sure Shawn himself is still surprised about. Edward’s deejay Aksun gets a chance on the final verse and he actually sounds better than the rest of Ed’s invited flunkies. Livin’ Like A Star – I think there was a moral to Edward’s nonsensical babble over the two verses on this song, but I’ve been wrong before. The second verse was really comical as Ed talks about his rented Toyota Corolla which is stolen by some chick he’s trying to bang. First of all Edward, who rents a Corolla? And furthermore, who would steal one? I know this was 1990 but a Corolla wasn’t even a luxury vehicle back then. See It Ya – Edward and his invited guest spend nearly 3 minutes sharing their interpretation of a raggamuffin style, failing miserably. Howie Tee’s instrumental is so bland and useless that Ed and company should have recorded it acapella. As Charles Barkley would say “this song was turrible”, but a fitting way to end Legal . Thankfully, Legal is a very short experience, as the majority of the material if useless and very forgettable. While Edward is a more than capable emcee, the musical backing tends to drown out his monotone voice, leaving the listener to daydream about insert “hottie of your choice” and contemplate what they’ll have for dinner tonight, while you completely miss Ed’s clever wordplay. Unfortunately young Ed’s music career would only go downhill from here. But look on the bright side: at least he didn’t end up like Chi-Ali. I enjoyed this just as much as his debut. Revelations was a horrible album. Sounded as is if he was forced to rhyme. His voice changed also. Remember he came out when he was 16 in 89. By 95 he was 23. On a side note. Actor Omar Epps directed the video for the single “Freaky Flow” off that album. Also he’s the 3rd producer aside from Easy Moe Bee and Kay Gee to have produced for 2pac and Notorious Big. In Big’s case it was for the Junior Mafia album. Technically not a Biggie album but still. To be honest, I like all 3 songs that say “insert commentary for “Ya Not So Hot” here” on the album. You’re right, though, Special Ed’s voice makes it a bore sometimes, but I still enjoy them.